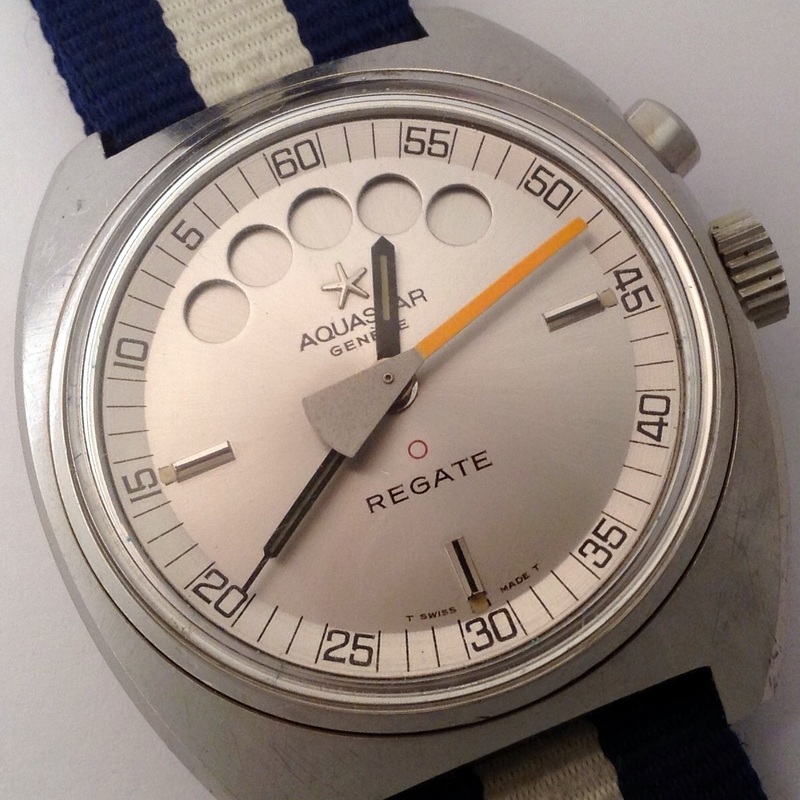 The in part one described first Aquastar Regate from the 1960’s with the Felsa 4000N movement was limited with a 5 minute regatta countdown. 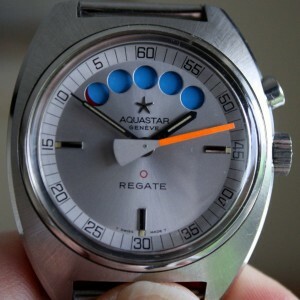 And as the regulations changed for regatta’s, a new movement was developed by Aquastar, now with a 10 minute countdown. 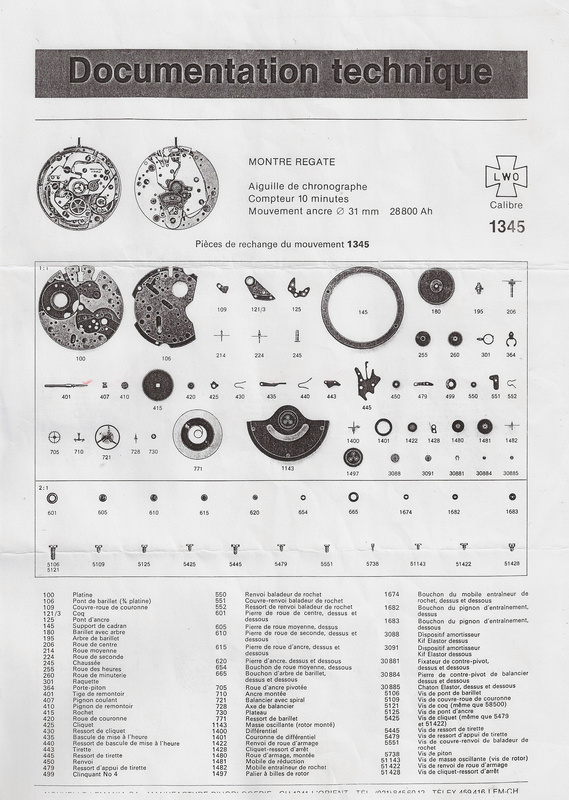 This time with the help of Lemania’s star designer Albert Piquet (his name is mentioned as inventor on the patent), and soon the new Lemania caliber 1345 was born! 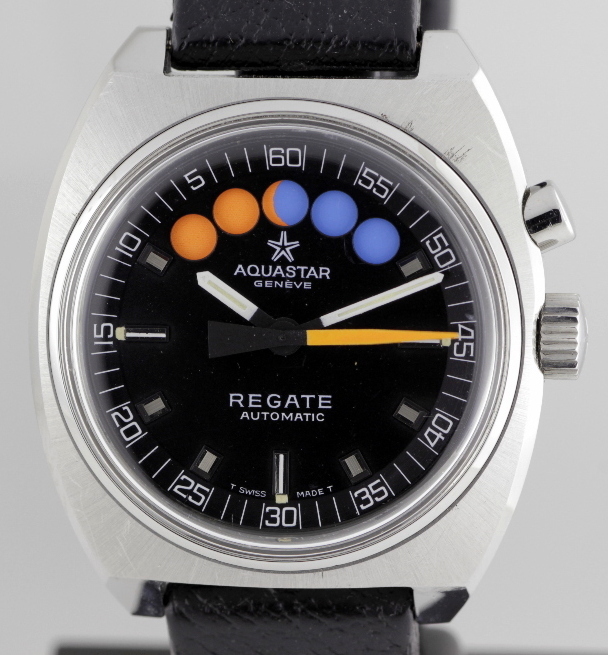 With this new patent (CH563037, US3910362) Aquastar is at the origin of all regatta watch developments which have been made subsequently on this coloured disc model used as regatta countdown with minute indicator. The new Lemania regatta caliber 1345 is derived from the 1341 movement. 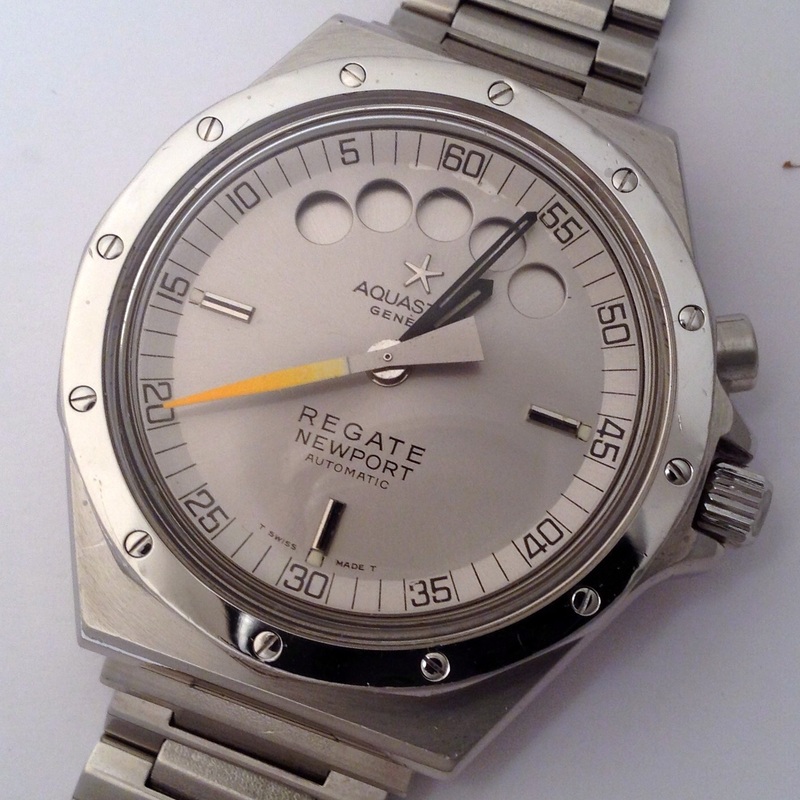 After the introduction of the new Aquastar Regate the Lemania 1345 movement comes available for other brands as well. 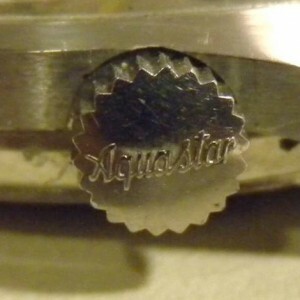 New patent filed by Aquastar, but ascribed to Albert Piques as inventor. Here the USA version 3.910.362. 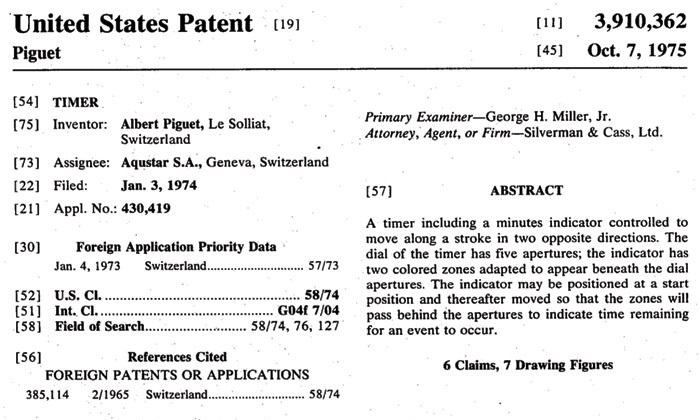 You can download the Swiss version of the patent as PDF here. New 1970’s model Aquastar Regate with the Lemania 1345 movement. 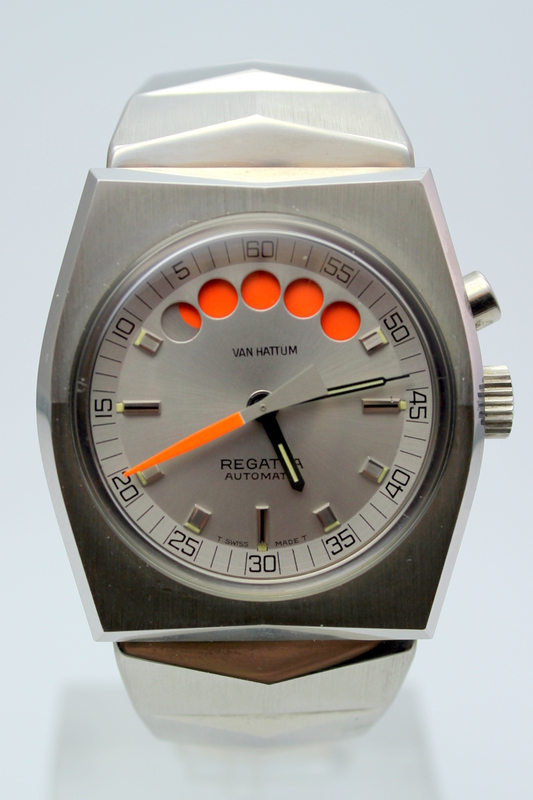 Caliber: automatic Lemania 1345 fly-back movement with regatta module. 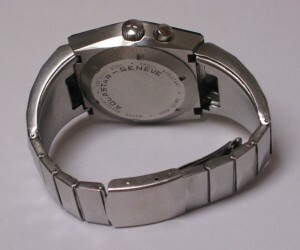 Case size: Ø 38,7 mm / H 15,6 mm. 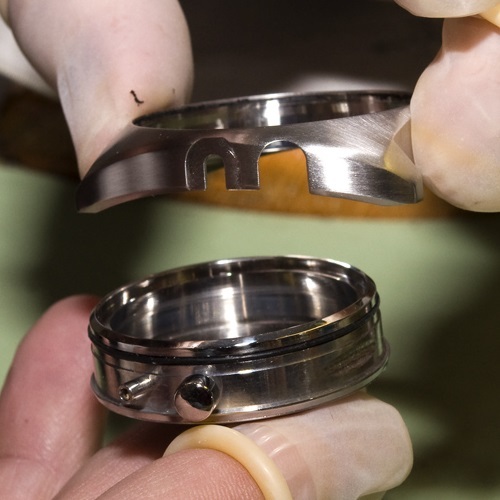 As the gasket between the two case parts looses its flexibility over the years, it can be very difficult to separate them. 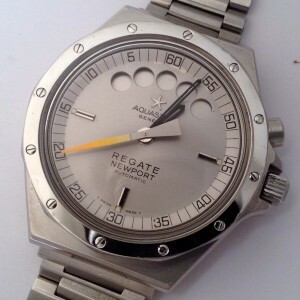 When using to much force, there’s a chance that the crystal will break and damage the dial and hands, so be careful if you are going to do this! 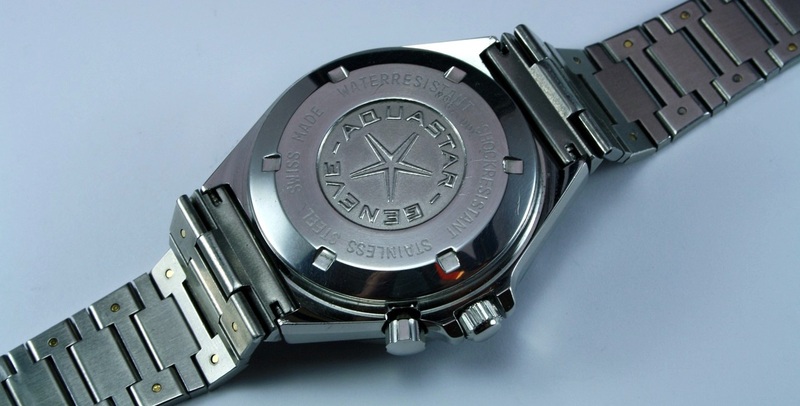 Other brands like Roamer, Seiko, Favre-Leuba and Heuer have used the same case design, but they all have a caseback that cannot be removed. 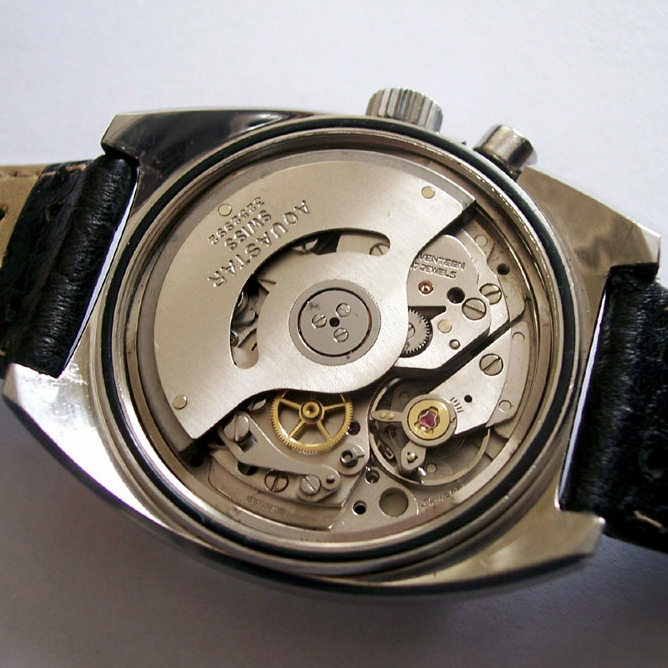 The crystal has to be removed first, to be able to take out the movement. 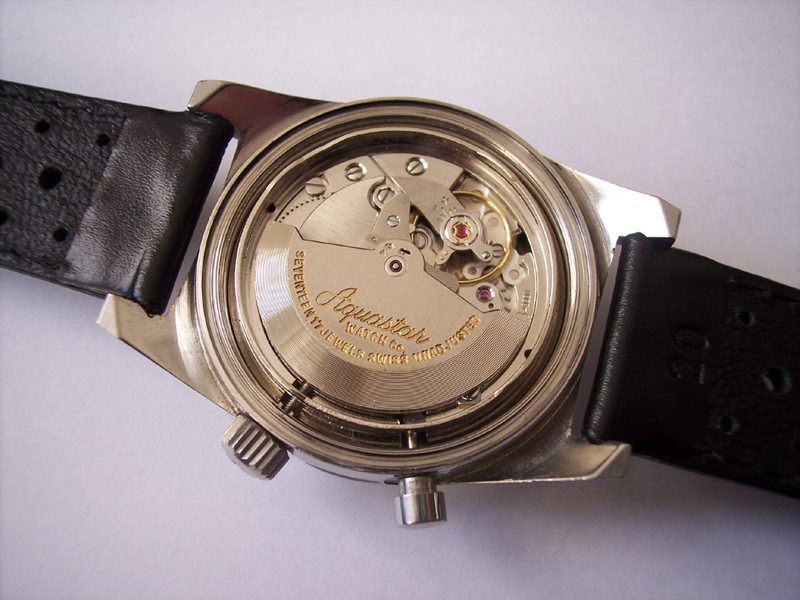 As Aquastar uses a normal screwed caseback, the movement can be removed from the back as usual, and there is no need to remove the crystal first. 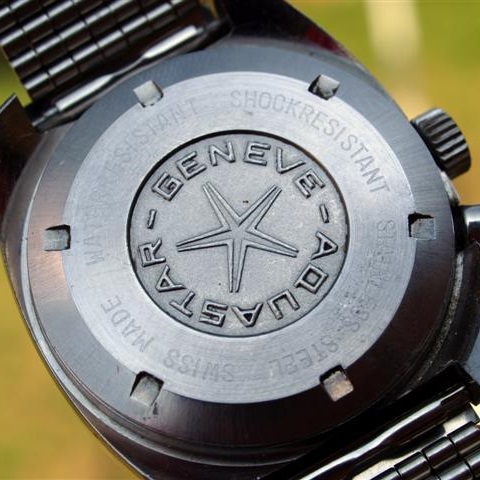 The caseback has an engraved circular section in the middle with the Aquastar star-logo and the text ‘AQUASTAR – GENEVE’, and a serial number engraved. 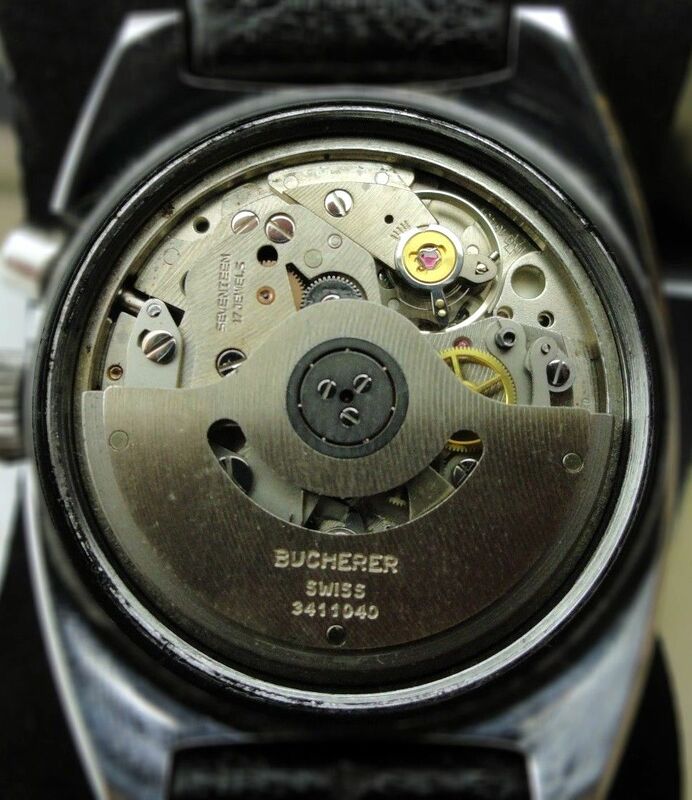 Click on the picture to have a better look. 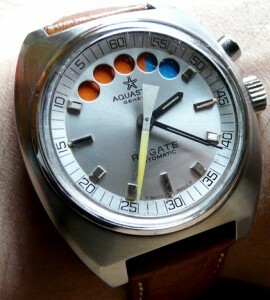 As many of these Aquastar Regate watches have been sold, they appear today with a variety of different straps. 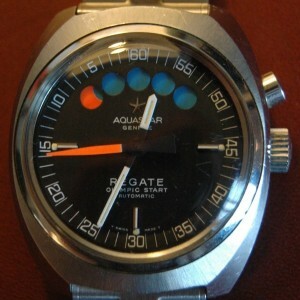 A 19 mm Isofrane rubber strap seems to be the original, but I think they came with a rubber Tropic Sport strap as wel. The straps had a buckle with the Aquastar star-logo on it. 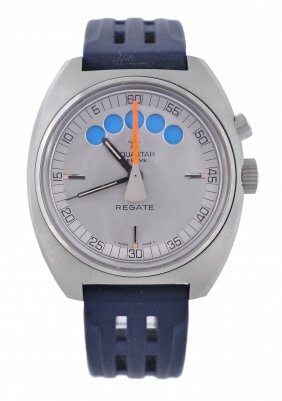 The Lemania regatta caliber 1345 is like the Felsa caliber 4000N in the first Aquastar Regate a modified chronograph with fly-back function. 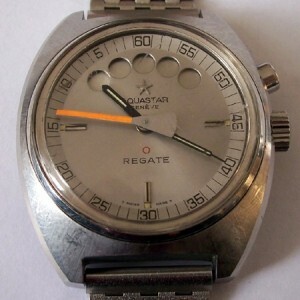 It has the crown to set the time at 3 o’clock, and one pusher at 2 o’clock for start/reset of the countdown. Under the dial lays the indicator disk coloured silver, red and blue (or black, red and blue in case of a black dial). There are five round holes cut out of the dial, between 10 and 2 o’clock. 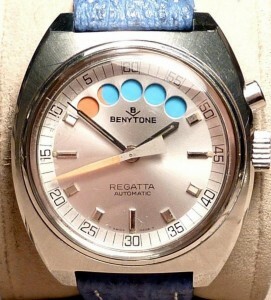 With the chrono activated the five dots colour blue and the sweep second hand returns to 60. By releasing the pusher the countdown starts and the sweep hand is set in motion counting backwards from 60 to zero. The indicator disk runs continuously clockwise. After one minute the first dot colours red, and after five minutes all 5 dots colour red. Again one minute later, so after 6 minutes, the first dot colours silver. 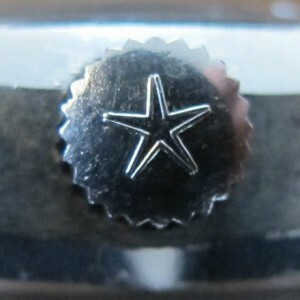 And after 10 minutes all dots colour silver. The indicator disk stops revolving, but the second hand moves on. Size: 13,75″ Ø 31 mm. The caliber 1345 is a modified Lemania 1341 movement, with the regatta parts integrated into the caliber. 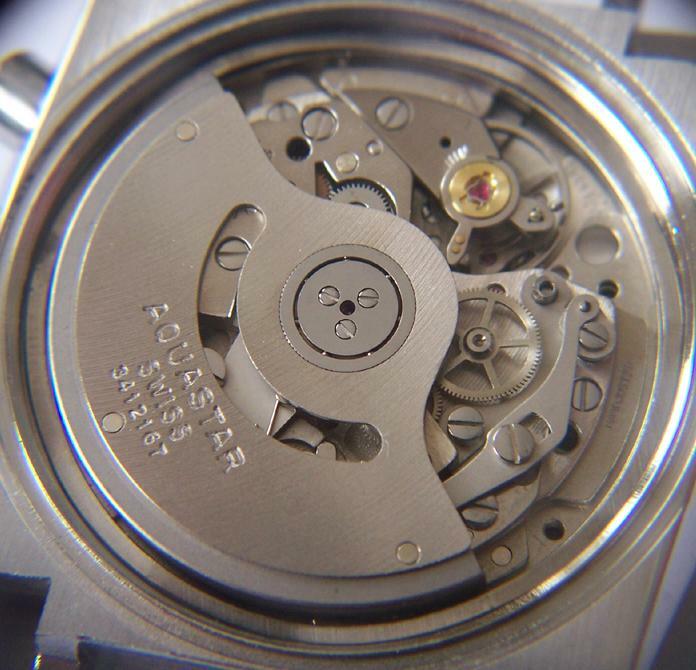 The caliber 1341 was used in some of the Omega and Tissot chronographs from the same period. A comprehensive description of how the Lemania regatta caliber 1345 works, is written by Richard Askham on his website Thewatchspotblog.com, see here. 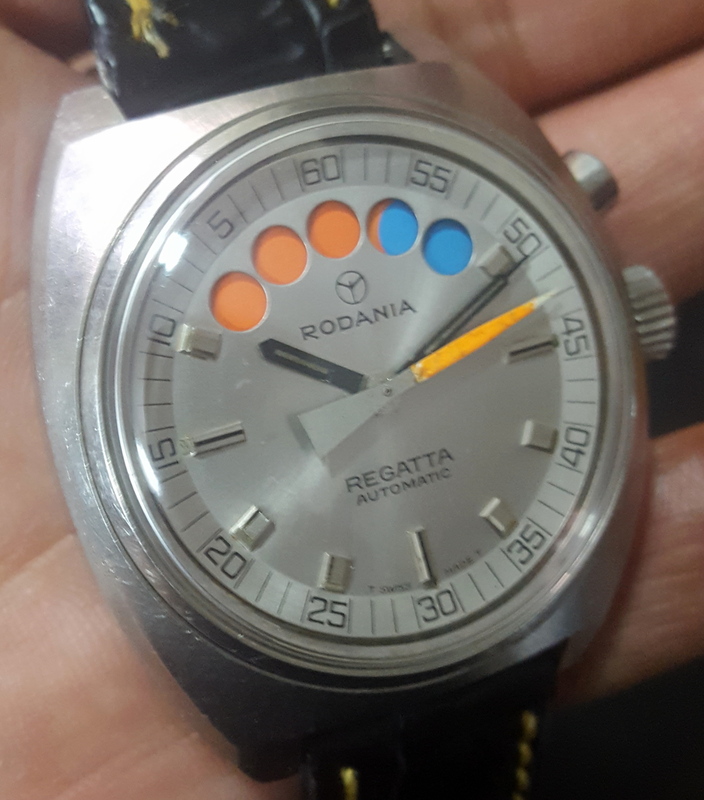 You can download two pages of the technical documentation of the Lemania regatta caliber 1345 here and here. 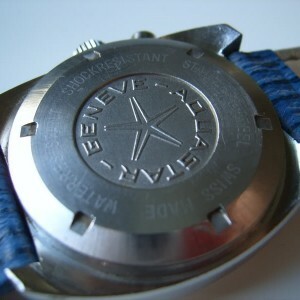 On the caseback of this lobster-type-case, there’s a text being painted. 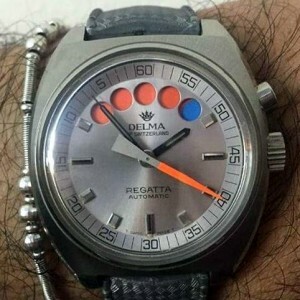 Unfortunately this would have quickly worn off, so it is hard to find one with the original text still intact these days. There’s also a serial number engraved. 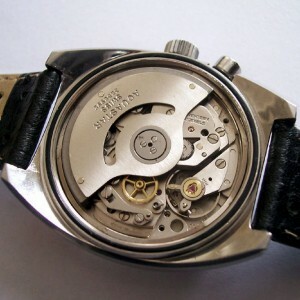 Most likely both cases were made by or for Lemania, as all watches that used it have a Lemania caliber 134x movement. 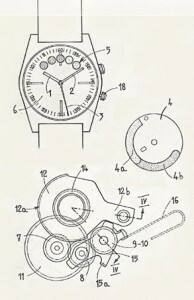 And as Omega, Tissot and Lemania were part of the SSIH group (see the Tissot section here), very similar cases were also used by these brands. 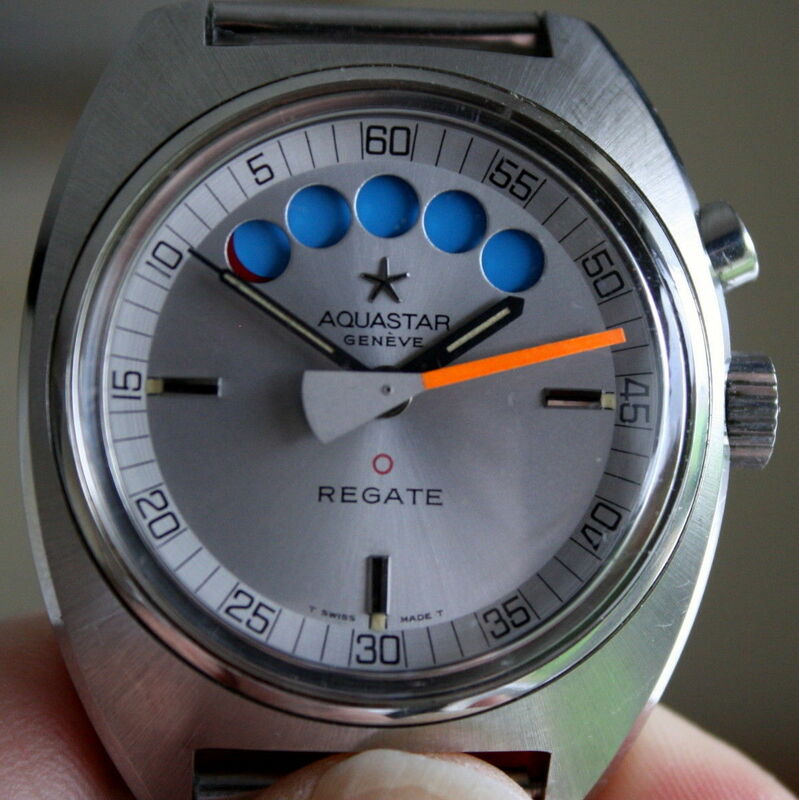 The silver-dialed version has black hour- and minute-hands; the black- and blue-dialed versions have white hands. These dials no longer have an aplied Aquastar star logo, but a painted one. The number of aplied hour markers has increased from 3 to 9 (from 2 upto 10 o’clock). 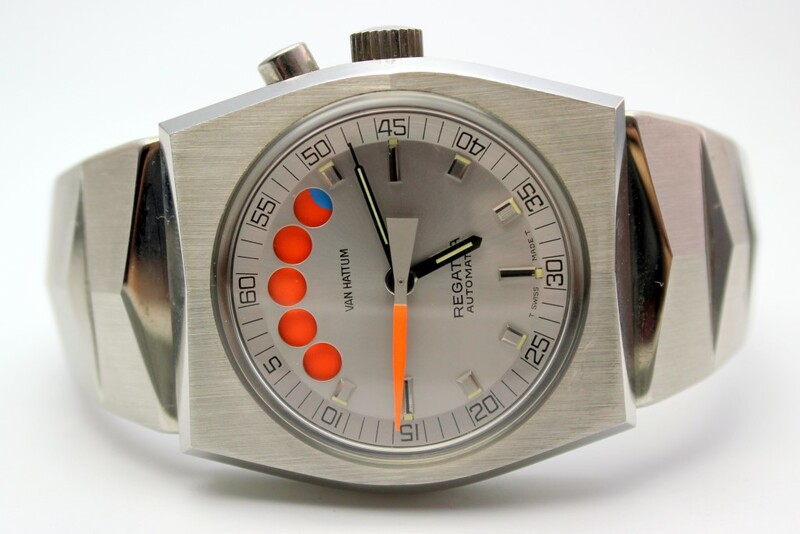 In all versions the big sweep-second hand is again orange, but changes from either with a straight (middle picture) to a pointed (left and right picture) tip. 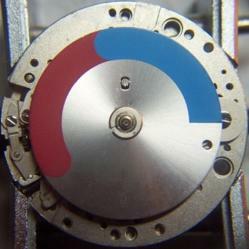 The indicator disk changed from blue-red to blue-orange. 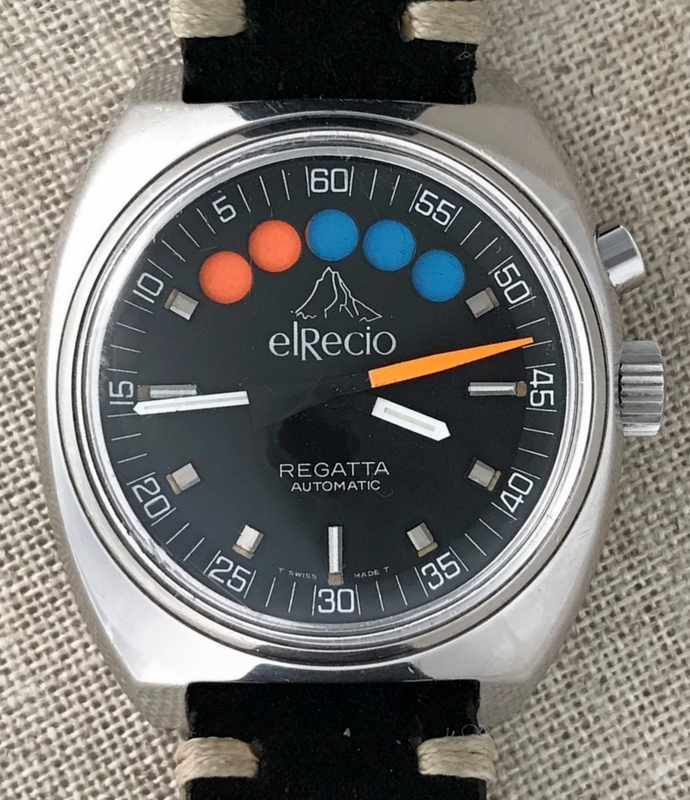 Benytone Regatta, Rodania Regatta, Delma Regatta and elRecio(?) 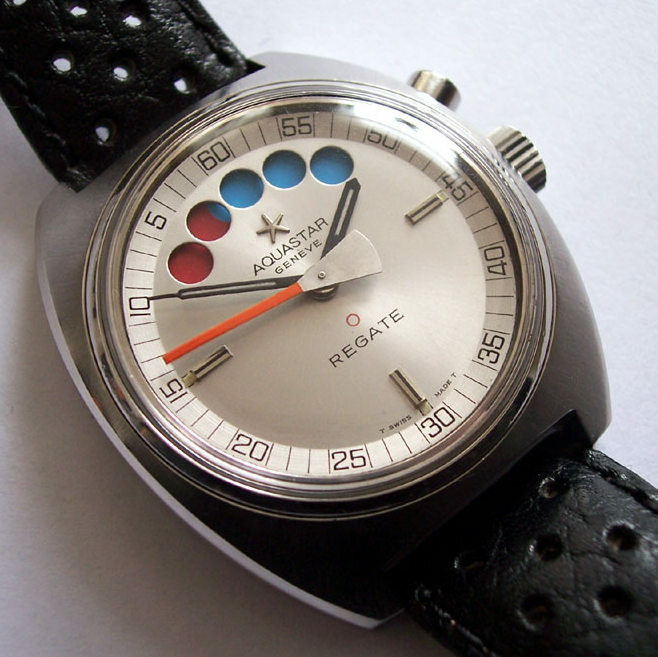 Regatta, all four housed in a Tissot-case with silver dial; Bucherer Regatta housed in an Aquastar case and the rotor signed ‘Bucherer’; Valgine Regatta and Pierce Regatta with black dial, both housed in a Lobster case. 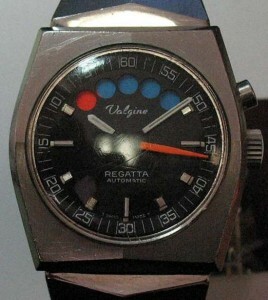 Note that all seven variations have 9 marker dials and are called ‘Regatta’ in stead of ‘Regate’. 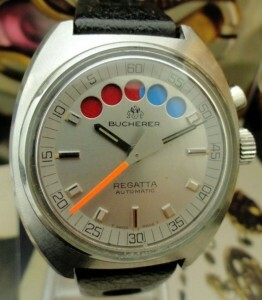 Aquastar lobster Regatta, signed VAN HATTUM. 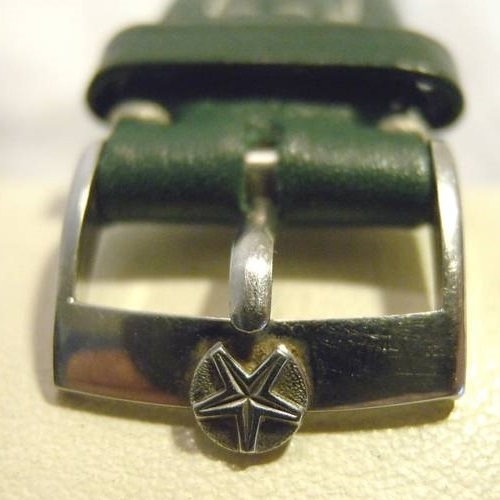 Van Hattum was a Dutch jewelry shop, located from 1909 upto 1990 at the Noordeinde in The Hague. 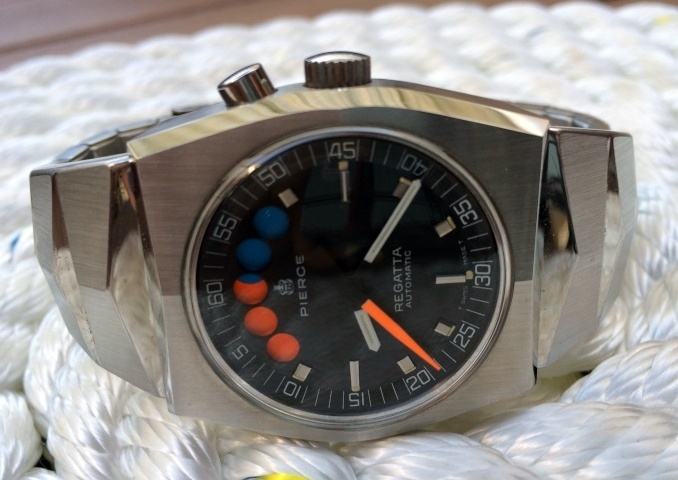 In the late 1970’s Aquastar then introduces the model Regate Olympic Start with the same Lemania 1345 movement, but in a different 1-piece case. This case is probably also made by or for Lemania, and must have been cheaper to produce, but I don’t know whether this was the reason. 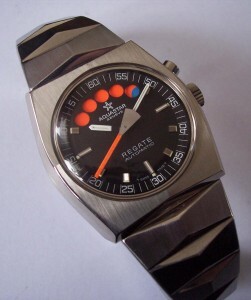 And again a similar case was used at least by Tissot for a Navigator. 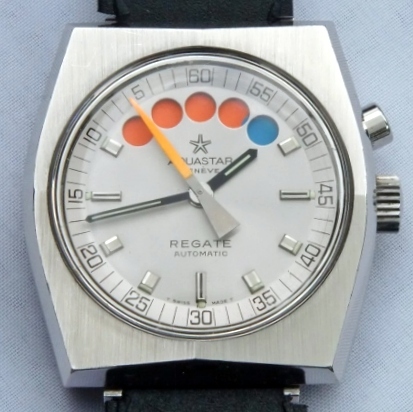 The number of aplied hour markers on the Regate Olympic Start dial is back to three, and the aplied Aquastar star logo is also back. Is was available with either a silver (with black hands) or a black (with white hands) dial. 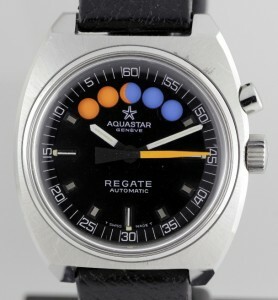 Late 1970’s model Aquastar Regate Olympic Start. 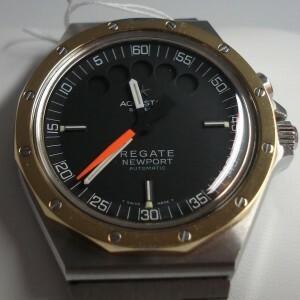 Model: Aquastar Regate Olympic Start. Case size: Ø 39,0 mm / H 15,8 mm. 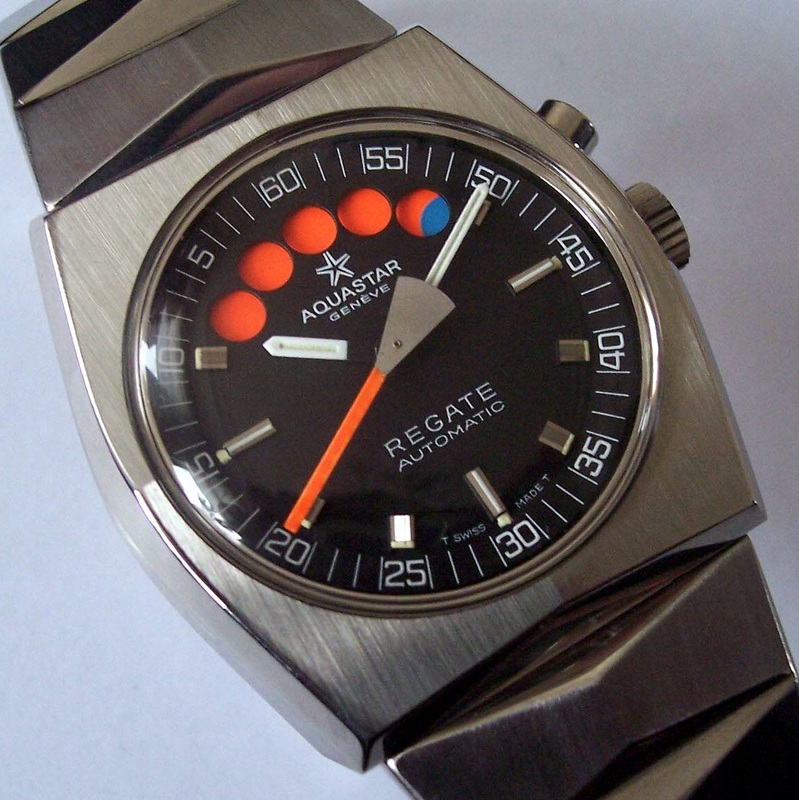 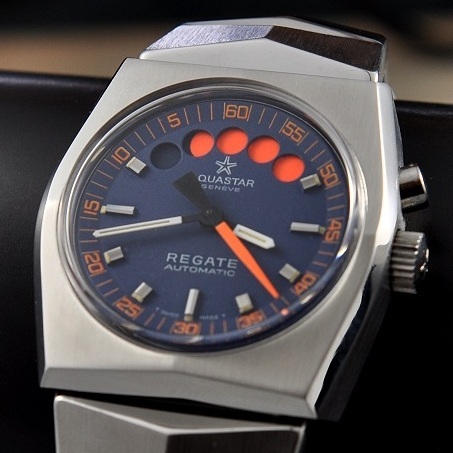 The last regatta watch that Aquastar released with an automatic movement, was the model Regate Newport in the mid 1980’s. 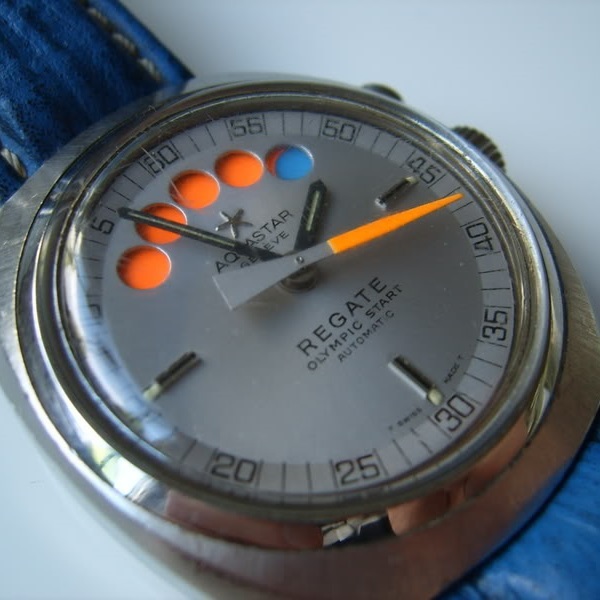 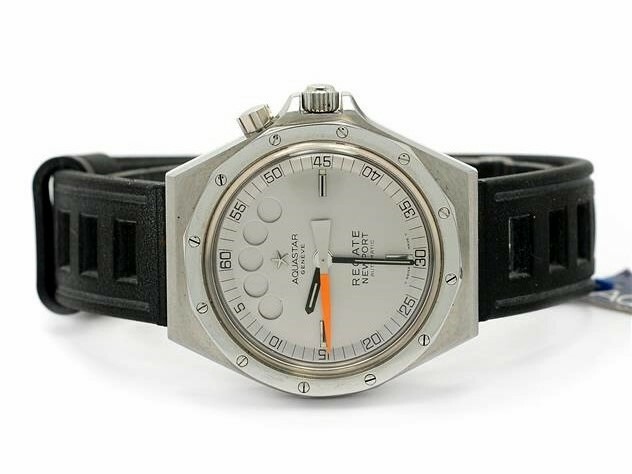 It houses the same Lemania 1345 movement as before, and uses the case from the Heuer 134.50X series in which Heuer had launched their Regatta models in 1983. 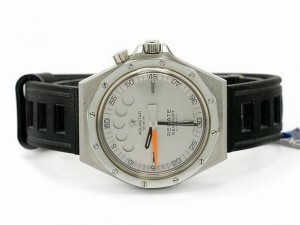 Obvious the collaboration with Heuer still existed. 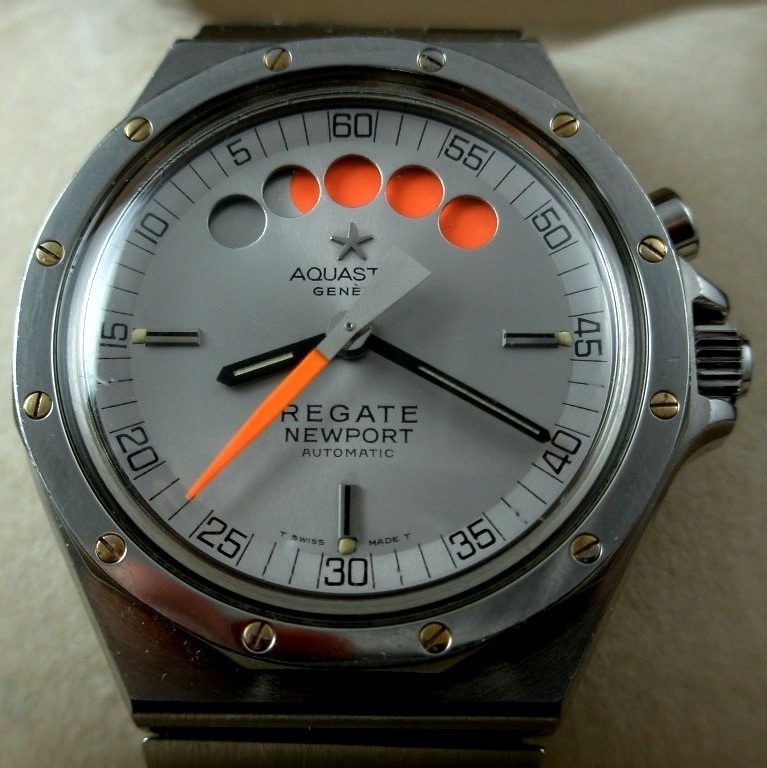 The silver and black dials are equal as in the Olympic Start models, except for the name Olympic Start which has been replaced by Newport. 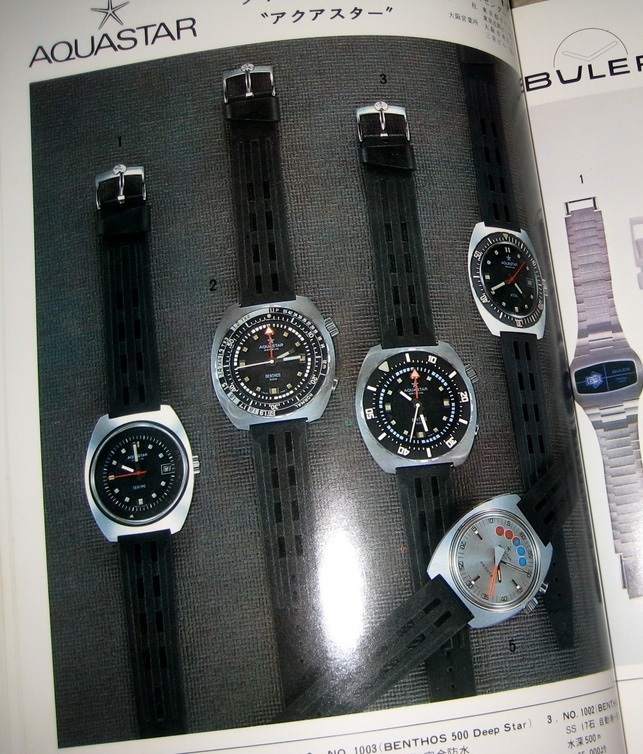 Although Heuer launched only two versions (134.500 and 134.505, see the Heuer section here), Aquastar had at least three different ones as shown in the brochure below. 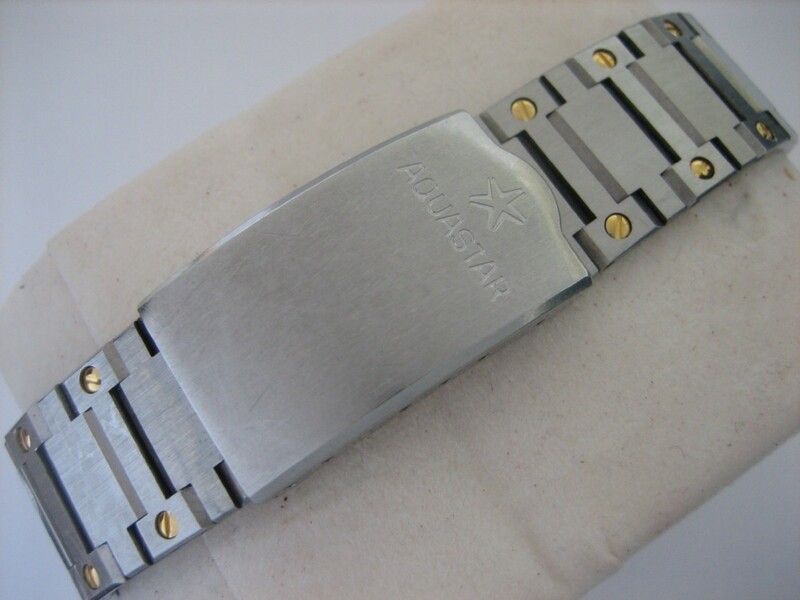 Pictured are a stainless steel case and bracelet with gold screws and black dial, a stainless steel case and bracelet with steel screws and silver dial, and a stainless steel case with golden bezel and steel screws, with an Isofrane rubber strap. Most likely other configurations where sold as well. 1980’s model Aquastar Regate Newport. 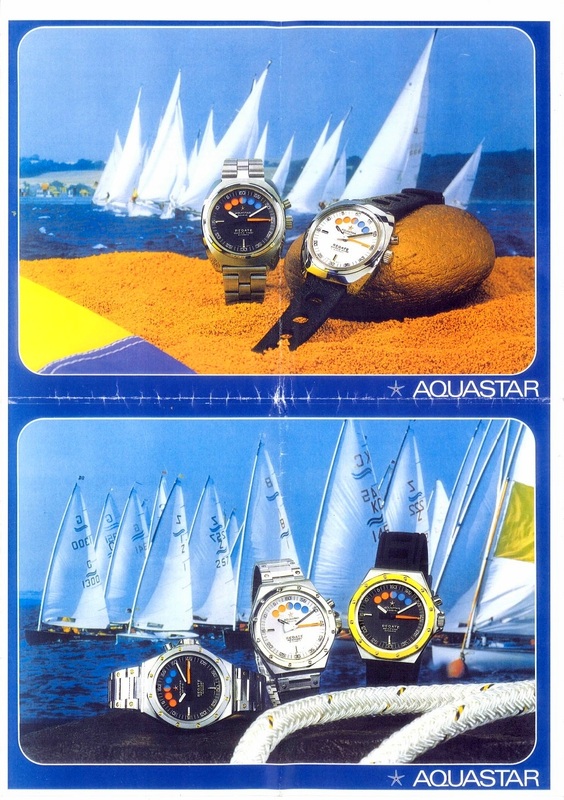 Aquastar brochure with both the Olympic Start and Newport models. This is the end of part 2. 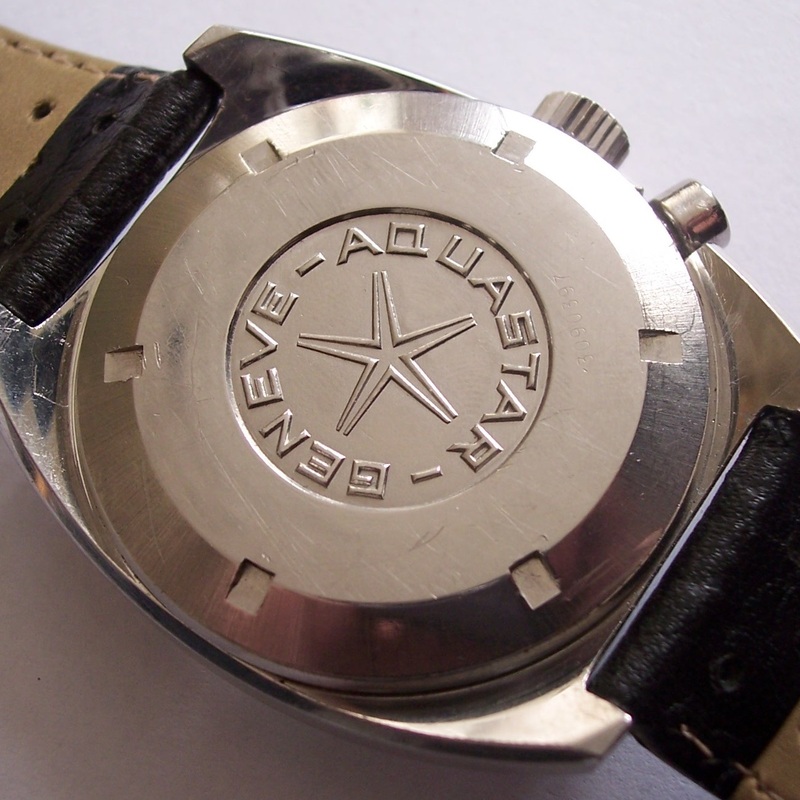 To be continued in the Aquastar 2000’s section. Many thanks to Richard Askham for your patience and helping me so much with this section. 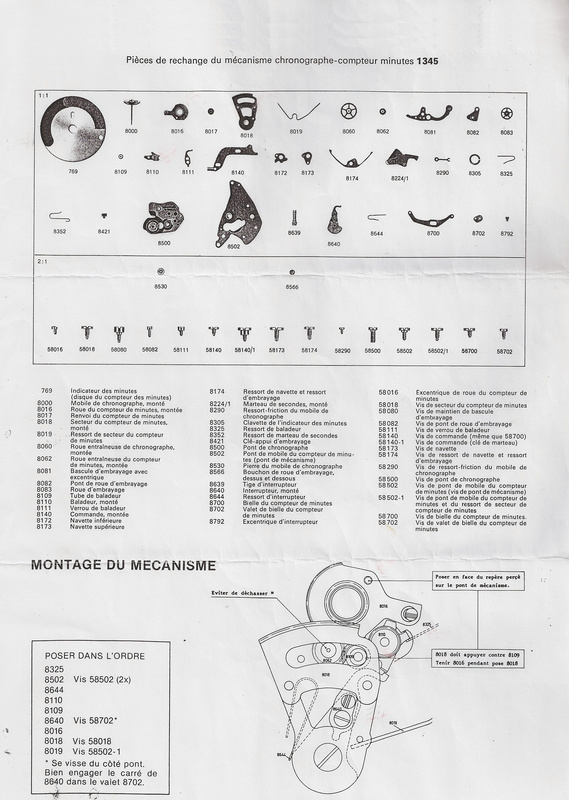 Many thanks to Roland for scanning your brochure for me. 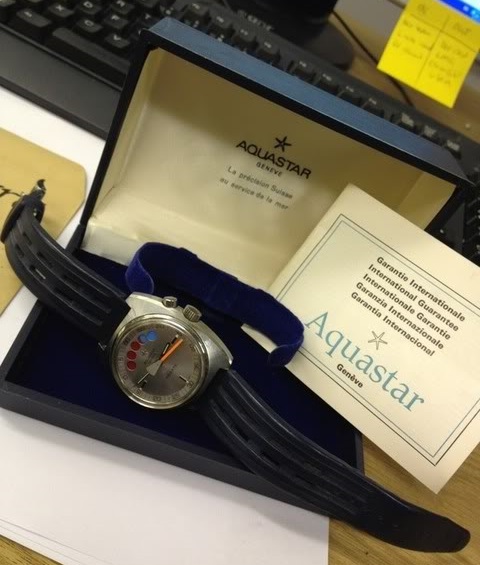 Many thanks to Manish Jain for sending me the picture of your Aquastar-Rodania-Regatta.